PORTOLA HILLS LIVING by Kelly Turbeville: Why move from Portola Hills... Just Sold 25011 Carol Ln. Why move from Portola Hills... Just Sold 25011 Carol Ln. We recently had the pleasure of helping a resident find a new home....sadly it wasn't in Portola Hills. 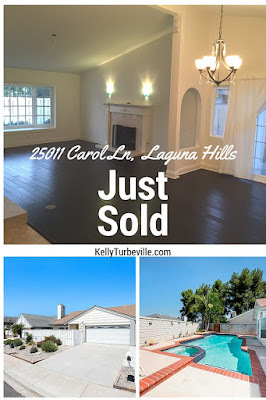 But they found a lovely home in Laguna Hills that fit their needs perfectly and we wanted to share in case you are in the search for something similar.. The buyers criteria had two main must haves for their new home... First... it had to be a single level and second include a pool and of course priced in their price range of under $700k. I will admit not the easiest task in South Orange County. Single level homes with pools are hard to find and with the median price range over $727k, to find one as lovely as this was a great find. The 3-Bedroom, 1742 square foot home was located on a private cul-de-sac street and recently upgraded throughout. Details included: Distressed Wood Flooring, Travertine Tile, Custom Lighting, Remodeled Gourmet Kitchen with Stainless Steel Appliances, Granite Counters, Farmhouse Sink, Fireplace in the Living room and Master Bedroom.. Plus a new energy saving Nest Learning Thermostat. Additions to the outside included: New Custom Drought Resistant Landscaping with a new secure 6ft Vinyl Fencing, Large Covered Patio, Rain Gutters and a updated Variable Speed Pool Pump. Originally listed for $699,000, sold for $669,000!! Yes... our buyer is very happy!! The home is located in the city of Laguna Hills, built in 1978, but as noted recently updated with the utmost of care. Sellers if you have an older home, updating it to today's standards is imperative to receiving top dollar for your home. Home Buyers today, know the market, they understand the numbers and you can trust they are doing their homework. Of course other factors such as inventory, location, etc are all going to affect the selling price of your home, but it is important to keep the buyers perspective in mind! Congratulations and welcome home to our newest client and homeowner! !